I am sad to hear the news today that the Revd Dr Roger Grainger died last night in a flooding accident on Achill Island. Roger was an 81-year-old retired priest who had recently moved from England to live on Achill Island. At first, he lived for a while in Corraunbuoy, Burrishoole, near Newport, Co Mayo, before he bought a house in Dugort. He had hopes for many further years of happiness in his retirement there and those hopes included continuing to practice as a counsellor and psychotherapist from his new home in Achill. He died on Sunday night when his car was caught in a flash flood at the junction near the Strand Hotel in Dugort as he was driving home alone after dinner in the Bervie. The flash flood caught his car in a dip in the road near the junction with the Strand Hotel and swept him and his car into a ditch where it was submerged in the water. Despite the immediate response of local people and the emergency services, he had drowned and was pronounced dead at around 11 p.m. The accident took place less than 1 km from his home and close to Saint Thomas’s Church, the Church of Ireland parish church in Dugort. Roger and his late wife, Doreen, had been regular visitors to Achill for over 40 years. 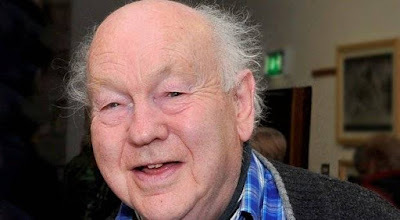 When she died in 2013, he decided to move to Achill, where he had immersed himself in the life of the parish, sometimes celebrating the Eucharist, reading the Gospel and contributing to Lenten and Advent discussion groups, in which he was adept at breaking down the barriers between the sacred and the secular. Roger was born in 1934 and had a varied and colourful life and career. He had studied at RADA and was a trained Shakespearian actor. He worked in sound radio with the BBC’s Children’s Hour, with Joan Littlewood’s Theatre Workshop and afterwards on stage at the Old Vic Theatre in London. He also had small parts in movies and television dramas. He trained for ordination at Lichfield Theological College from 1964 to 1966. He was ordained deacon in 1966 and priest in 1969, servung as a curate in All Saints’ Church, West Bromwich (1966-1968), in the Diocese of Lichfield, and served a second curacy in Walsall (1969-1973). As a priest, he continued to have an active interest in drama and television. His credits included some episodes of Emmerdale as well as four episodes of the BBC series Last of the Summer Wine, beginning with the episode ‘The Odd Dog Man,’ and including the episode ‘Heartbeat,’ in which Bill Thomson, a farmer, is persuaded to con the insurance in order to pay for his wife’s funeral. In Yorkshire Television’s drama, Remember Me, starring Michael Palin, he was the angry patient who complains that Palin’s character has run off with his clothes. But he spent most of his life as a priest serving as a psychiatric chaplain in the Stanley Royd Hospital in Wakefield from 1973 until he retired in 1991. He was a pioneer in the concept of drama therapy, and when he stayed on in Wakefield after his retirement he became the Diocesan Drama Adviser in 1998. He was an inveterate and incurable student, and took one degree after another throughout his working life. Indeed, he was about to start working towards yet another doctorate at the NUI Galway on Irish expressionist theatre, with a special interest in the human condition and life and death as addressed by playwrights such as Samuel Beckett. Earlier this year, he attended the Heinrich Böll Memorial Weekend in the Cyril Gray Memorial Hall, Dugort, to hear my paper on ‘TS Eliot (1888-1965): the Nobel poet and his Irish connections’ [2 May 2015]. Later, we had a laughter-filled conversation about Lichfield, Eliot, poetry, drama, Achill, ministry, counselling, sacramental life and theological education. Roger was a compassionate theologian and priest with a great heart, a joyful sense of humour and wide-ranging cultural interests. He is survived by his four sons. A memorial service is being planned for Wakefield Cathedral. Arriving back in Dublin from Greece in the early hours of Sunday morning [13 September 2015] was a real shock to the system. The temperatures in Crete all last week were in the high 30s each day, the skies were blue, and I was able to swim in the warm blue waters of the Mediterranean and walk along the long sandy stretch of beach east of Retymnon each day. But I awoke to a chilly Dublin, and as two of us set off for Belfast late on Sunday morning or early on Sunday afternoon, it was a cold day, and it rained heavily for much of the journey, making driving conditions on the M50 and the M1 quite treacherous. I was in Saint Anne’s Cathedral, Belfast, for the ordination of four students as deacon. It is not possible in this ordination season to get to all the ordinations, but happily many of the other students whose ordinations I have been missing were there too. There was a warm welcome from both Bishop Alan Abernethy of Connor and Dean John Mann of Belfast, and I was asked to read the Epistle reading (Romans 12: 1-12). It was a pleasure too to find that the preacher was an old friend, the Very Revd Pete Wilcox, who is Dean of Liverpool Cathedral. He and his wife Catherine Fox have has been good friends since he was the Chancellor of Lichfield Cathedral and they lived in the Cathedral Close in Lichfield. On the road back from Belfast, the rain had eased off and the fields of the Down and Armagh countryside were arrayed in autumn colours of green and gold. In Carlingford, Co Louth, two of us stopped for a meal in the Bay Tree. This is a charming mediaeval town, with a number of castles and mediaeval houses and buildings. Before darkness closed in on Carlingford and before going to eat, I went for a stroll around the harbour, and then through the narrow streets of the town, where some of the vacant buildings are decorated with captivating and amusing paintings. Later, after dinner, I had another brief walk along the shoreline. It was dark by now, but Carlingford Castle was lit up, and bird calls could still be heard from the waters of Carlingford Lough. Summer is gone, and I shall have to wait until next year for hopes of Mediterranean summer sun. But hopefully autumn may linger a little and allow some more walks in the countryside and the beaches.